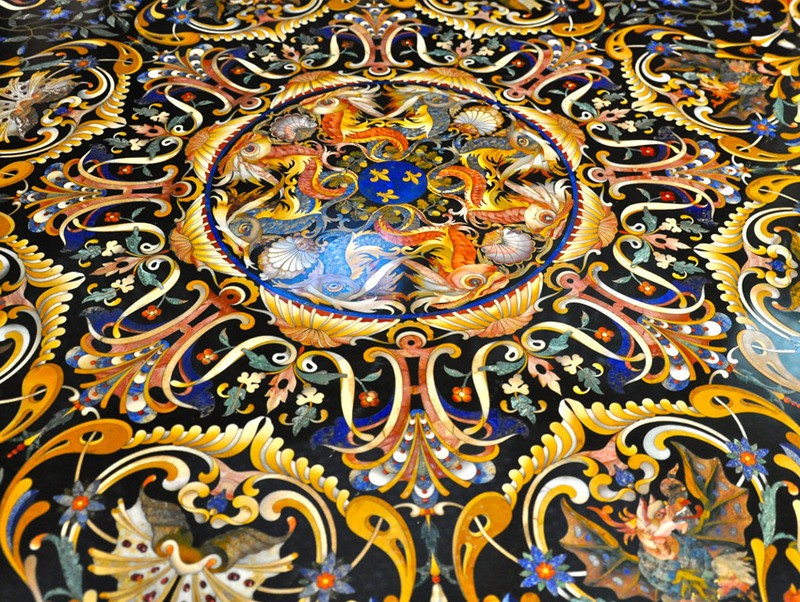 The Pitti Palace museum is closed on Monday. This tour is possible Tuesday – Sunday. The Pitti merchant home was bought by the Medici Grand Duke Cosimo I in the middle of the 1500s and little remains of the previous family’s residence as it was immediately transformed into the principal ducal palace. The gardens and the palace were added to continuously throughout the centuries making them the huge complex today. After the Medici line ended in the 1700s, the Lorraine-Hapsburg family took the title of the Grand Duke of Tuscany and lived here for four generations until the unification of Italy in the 1860s, when the then King and queen of the new nation lived here. 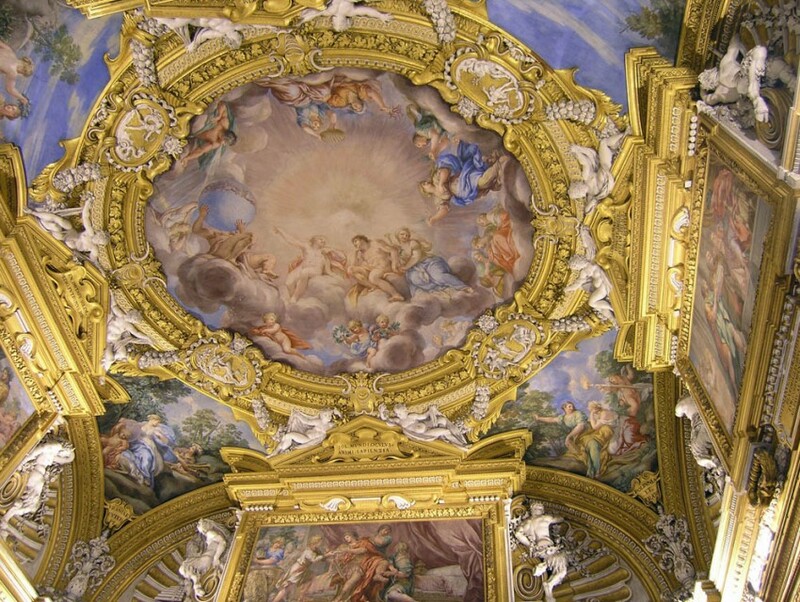 This tour visits the principal reception rooms on the first floor with the sumptuously decorated ceilings from the 1600s, a fabulous example in Florence of the dramatic and theatrical artistic Baroque style. The walls of these rooms are now covered with masterpiece paintings by Titian, Raphael, Andrea del Sarto, Peter Paul Rubens, Murillo and Rosso Fiorentino, to name a few big names. 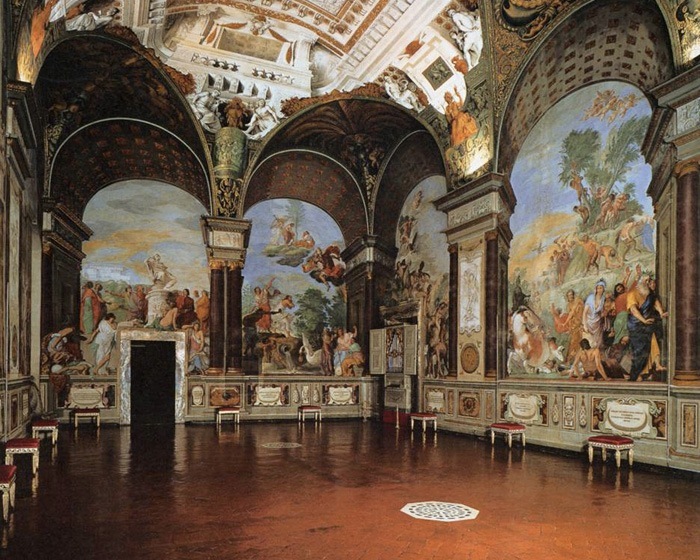 Afterwards, we visit the summer reception rooms on the ground floor, again with spectacular fresco decorations. These rooms showcase the outstanding objets d’art collections that the individual family members specialised in; ivory sculpture, amber reliquaries, crystal and lapis lazuli centrepieces. Lastly, the tour visits the world famous Boboli Gardens, some of the first landscaped gardens since antiquity. To the right of the ticket office entrance of the Pitti Palace complex. The ticket office is located to the far right side of the Pitti Palace building. All of our tours that we organise are private. We do not organise group tours. 315€ when you book for up to 5 people. 332,50€ when you book for 6-9 people. 350€ when you book for 10 or more people. ADMISSION FEES to sites not included in the hourly rate. Admission fees to be paid on the day at the ticket office with guide. There are two separate tickets in this tour. One ticket covers the Palatina gallery (main reception rooms and painting gallery) and a different ticket covers the ground floor granducal reception rooms and the Boboli gardens. March 1st -October 31st: Palatine Gallery €19pp for adults (€16 ticket cost, €3 advanced reservation fee), €3pp for children under 18yrs (original passport or copy either paper or digital copy of passport, required for proof of age). Boboli Gardens €13pp (€10 ticket cost, €3 advanced reservation fee). November 1st-February 28th: Palatine Gallery €16pp for adults (€13 ticket cost, €3 advanced reservation fee), €3pp for children under 18yrs (passport required for proof of age). Boboli Gardens €9pp (€6 ticket cost, €3 advanced reservation fee). There is rarely a queue at the Pitti Palace ticket office so we do not make ticket reservations in advance. However, if there happens to be one, an extra payment of 3€ per person (in addition to the ticket admission) can be paid immediately which jumps you ahead of any line. Under 18 years are free to state museums (Accademia, Uffizi gallery, Pitti Palace, Bargello sculpture museum) however, an original passport is the necessary document to show as proof of age at the ticket office of each museum. Freya’s Florence will book these in advance and they will be distributed at the beginning of the tour and used for the entire tour. For parties of 10people and less the total cost for a half day tour is €25 for a full day tour is €50. Please note that the Boboli gardens are not flat. There is a steep incline to the top of the gardens and the paths are mostly dirt and pebbles. Appropriate and comfortable footwear is advised.